Thousands join prayers asking G-d to strengthen leaders and cancel Kerry plans to establish Arab capital in Jerusalem. 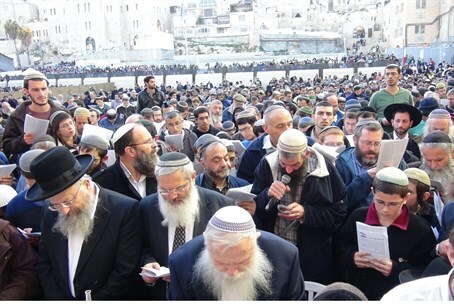 A massive gathering brought thousands together at the Kotel (Western Wall) Thursday night, in prayers beseeching G-d to "cancel the decrees" of US Secretary of State John Kerry, whose peace plans would create an Arab capital in Jerusalem. The prayer rally, which was held under the title "prayer for the redemption of the people of Israel and their portion," was attended by Jewish Home coalition members including Housing and Construction Minister Uri Ariel, Deputy Religious Minister Rabbi Eli Ben-Dahan, MK Orit Struk and MK Moti Yogev. Rabbi Chaim Druckman, head of the Bnei Akiva yeshivas, Chief Rabbi of Kiryat Arba Rabbi Dov Lior and Chief Rabbi of Tzfat Rabbi Shmuel Eliyahu led the prayers, asking G-d to "give strength, courage, truth and faith to our leaders. Give them fear and great awe of You, that they will fear greatly to harm our holy land." Ariel commented that "thousands of people came to prayer for the people of Israel, to strengthen the government and the one who stands at its head, that he may be able to stand firm against the different pressures coming from the other side of the ocean," reports Mako. Reports in early January indicated that Kerry is manipulating the European boycotts to force Israel to submit to territorial withdrawals. "We came here to strengthen the prime minister in guarding the land of Israel," said Rabbi Ben-Dahan, who added that if the proposed plans match the rumors surrounding them, they will not be accepted by his Jewish Home party. "Most residents of the country aren't ready to divide Jerusalem, as is said to be proposed in the plan." The plan also reportedly would have the PA create a state along the 1949 Armistice lines. Prime Minister Binyamin Netanyahu proposed on Sunday that Jews lived under the Palestinian Authority (PA) in Judea and Samaria as part of peace plans, a proposal that led to a crisis between Netanyahu and Jewish Home Chairman Naftali Bennett.